New graduate programs and changes to existing programs must be approved by the appropriate College Dean, the Graduate Council, SUNY Central in Albany, registered with the State Education Department (SED), and approved by the Department of Education. Before you submit a Letter of Intent, a program proposal, or proposed changes to an existing program, it is recommended that you request a consultation with Richard Gerrig, Interim Dean of the Graduate School at Richard.Gerrig@stonybrook.edu. Please copy Colleen O'Toole ( Colleen.OToole@stonybrook.edu) on email requests. In general, changes to an existing program of 9 credits or fewer (cumulative) need approval only by the appropriate College Dean and the Graduate Council. All other changes need approval by SUNY Central, registration with the SED, and approval by the Department of Education. The estimated timeline for approval of such changes is 6-24 months. New graduate degree program proposals first require a Letter of Intent (LI), which, after Graduate Council approval, is sent to SUNY Central. The SUNY Provost disseminates the Letter of Intent to other SUNY campuses for a 30-day comment period. After this comment period and SUNY approval, a full program proposal can be prepared and submitted for approval. 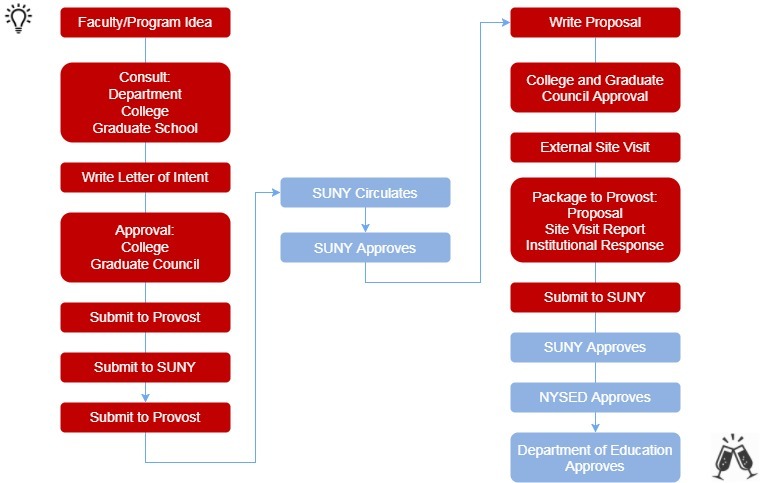 This proposal process includes an external review by at least 2 SUNY-approved external evaluators and institutional responses to these comments. It is then sent to the Department of Education for review and approval. In general, the timeline from initiation of a new program to final approval can be 2 years or more. New graduate certificate programs do not require a Letter of Intent. The required program proposal for graduate certificate programs will need College Dean approval and will be submitted directly to the Graduate Council for review before submission to SUNY. In the graphic below, Stony Brook steps are in red, SUNY Central, NYSED, and Department of Education in blue. 1. Once a proposal is prepared, to whom is it submitted and what happens next? All Letters of Intent and program proposals should be submitted to Richard Gerrig, Interim Dean of the Graduate School ( Richard.Gerrig@stonybrook.edu) with a copy to Colleen O'Toole ( Colleen.OToole@stonybrook.edu). Before submitting the Letter of Intent or program proposal, however, it is recommended that you request a consultation with Dean Richard Gerrig. This consultation may save you time in the overall process and help you clarify any questions you may have. After review of your completed proposal, Dean Richard Gerrig will submit the proposal to the Graduate Council for full review and comments. If necessary, the Council may request a conference with the program director. After final approval by the Council, the proposal is approved by the Dean of the Graduate School and the Provost. The Office of the Provost is responsible for preparing a cover letter and submitting approved proposals to SUNY Central. 2. What constitutes a minor change requiring only local approval by the Graduate Council? A change of program involving 9 credits or fewer (cumulative since the last registration at SED). For minor changes, please prepare a memo addressed to the Graduate Council describing the change and the rationale for the change. The Graduate School will verify whether the proposal also needs SUNY, SED, and Department of Education approval. 3. How many credits are required for a new graduate certificate program? There is no formal limit. In general, certificates comprise a minimum of 12-15 credits. Professional certificates often require more credits. 4. Is a Letter of Intent required for new graduate certificate programs? No, only new graduate degree programs require a Letter of Intent. 5. When should one begin to plan for the external review? Once the Letter of Intent is approved by SUNY Central, a list of 5 qualified external examiners and their CVs should be submitted to the Dean of the Graduate School, who will transmit the names to Albany for approval. SUNY will typically select 2 reviewers from the list. 6. Who pays for an external review? The program pays for the external review. 7. Who can I contact at SUNY, SED, or the Department of Education about my proposal? You may not directly contact SUNY, SED, or Department of Education unless they initiate a question to you. The Provost's Office is the single point of contact, and it is advisable to work through the Graduate School if you need to communicate with SUNY, SED, or Department of Education. 8. What is the Stony Brook University SED code? 9. What is a HEGIS code? A HEGIS code is a numerical designator of the taxonomy of academic programs. The guide is available for download at http://system.suny.edu/media/suny/content-assets/documents/academic-affairs/SUNY-Guide-to-Academic-Program-Planning.pdf. Depending on the program proposal, you will need some of the following required forms, available at http://system.suny.edu/academic-affairs/acaproplan/app/forms/. You may also be required to submit supplemental forms (see details on website). Questions? Email Richard.Gerrig@stonybrook.edu and Colleen.OToole@stonybrook.edu.